Cyclamineus Daffodils have two to three pendulous flowers per stem with reflexed petals which resemble cyclamen. Extremely early to flower -- they lift you out of the winter doldrums. As a group they are more tolerant to partial shade and moisture. Ideal for the rock garden and containers, they are good for forcing and naturalize well. One of my favorites! Earliest to bloom. 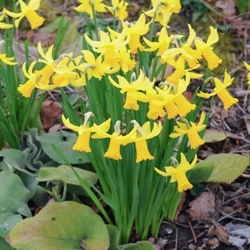 February Gold Daffodils have 2 or 3 pendant cyclamen-like flowers with reflexed petals. One of the earliest. Lemon-yellow perianth, frilled sulfur yellow trumpet. Ideal for the rock garden. 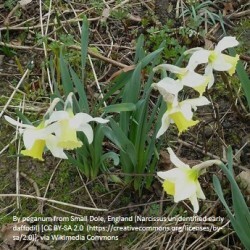 Jack Snipe Daffodils have reflexed, creamy-white petals with a buttercup-yellow trumpet. Ideal for the rock garden. 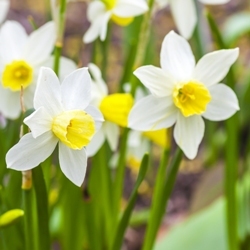 Jenny Daffodil opens with a yellow cup that ages to white. When mature, the entire flower is pure white, and the petals are entirely swept back. Long-lasting. 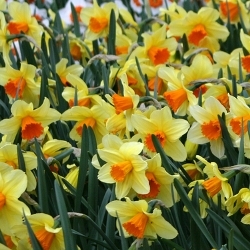 Jetfire Daffodil has a vivid yellow, reflexed perianth and a strong orange trumpet. It's an early bloomer and can be forced. Ideal for the rock garden. 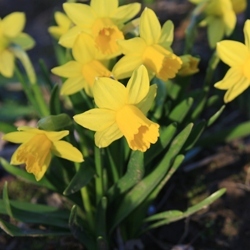 Tete a Tete Daffodils have reflexed golden yellow petals with pale orange trumpets. One of the smallest (6"). Several flowers on each stem. Ideal for the rock garden.